Now, shall we converse? I’d like to know how an Oriental might smuggle an invalid out of the country. Any ideas? 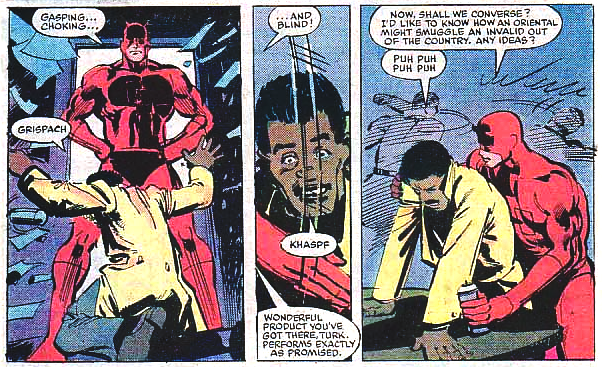 Now, don’t get me wrong, seeing words like “oriental” and “invalid” in a decades old comic book doesn’t do much more than cause me to raise an eyebrow – it even strikes me as a tad humorous in this particular context – but you have to wonder if they’d get away with using either one of these terms today. I’m going to guess no. Either way, Matt apparently got some “sensitivity training” along the way, not that you would think he’d actually need it, being blind himself. In Daredevil #93, Brubaker even takes it one step further and indirectly debunks the word “handicapped” in a move that seemed about fifteen years overdue (yeah, really). 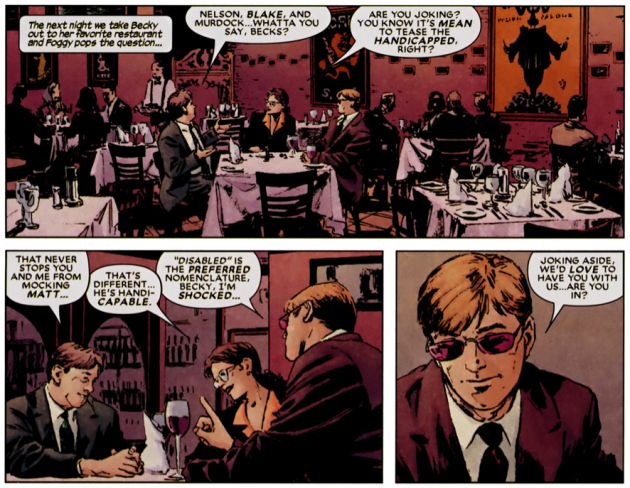 I’m personally a big fan of the scene below for other reasons too, since it’s one of the rare instances of humor in the Brubaker run. Matt has always been good at self-deprecating jokes and I’ve missed the dry wit he so often exhibited during Bendis’s run. Let’s see if Diggle can bring some of it back.